The custom of "Beating the Bounds" is to recognise the importance of the parish boundary. A tradition that has its roots in Terminalia, a May time Roman festival , which includes punishments of beatings and sacrifices to honour their boundary god Terminus. the name of a parish, and a scroll, showing the boundaries. they were handed to the Prince of Wales on 13th July 1933. In essence the custom involves the local inhabitants of a Manor or village perambulating their parish boundary to bless the crops, pray and at certain points, which denote the extent of the boundary (usually a gatepost, wall, tree or boundary stone) to ritually beat the certain landmark with sticks, switches and birches. 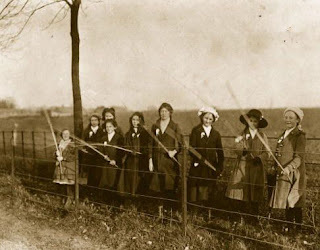 However, more often or not it was the girls and boys of the parish who would have their backsides ritually tanned by birch over or up against the boundary marker. Although these beatings were often harsh, they were considered necessary to ensure the imprinting of the exact location of the parish boundary on successive generations and thus serve to ensure any neighbouring parish did not encroach upon the boundaries. Before the Reformation these annual processions were highly important and ceremonial affairs with Lords of the Manor, their bailiffs, reeves and stewards being present, as well as the clergy and the parish officials. Knowing ones parish boundaries has little significance these days and therefore the importance of the custom has not surprisingly diminished over the years. Even so the Beating of the Bounds custom still continues in some places though in a much diluted form. "Beating the Bounds.—It was the general custom in olden days, and is still observed in many parishes in Dorsetshire, for certain persons to go round, or perambulate the boundaries or limits of their own particular parish in Rogation Week, or,—to be more precise,—on one of the three days before Holy Thursday or Ascension Day, though more often, I think, on Holy Thursday itself. Upon these occasions, as Brand (i, 168) tells us, " the minister, accompanied by his churchwardens and parishioners, were wont to deprecate the vengeance of God, beg a blessing on the fruits of the earth, and preserve the rights and properties of the parish." 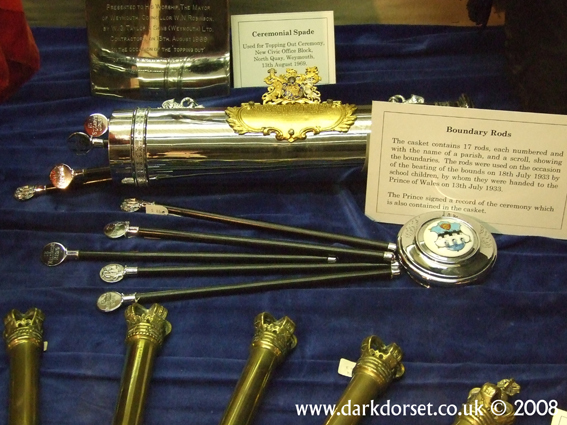 In Dorsetshire the last of these objects would seem to be the one principally or solely considered at the present day. This perambulation is known as "Beating the Bounds". "A Perambulation, or, as it might be more correctly called, a circumambulation, is the custom of going round the boundaries of a manor or parish, with witnesses, to determine and preserve recollection of its extent, and to see that no encroachments have been made upon it, and that the landmarks have not been taken away. It is a proceeding commonly regulated by the steward, who takes with him a few men and several boys who are required to particularly observe the boundaries traced out, and thereby qualify themselves for witnesses in the event of any dispute about the landmarks or extent of the manor at a future day. In order that they may not forget the lines and marks of separation they ' take pains y at almost every turning. For instance, if the boundary be a stream, one of the boys is tossed into it; if a broad ditch, the boys are offered money to jump over it, in which they, of course, fail, and pitch into the mud, where they stick as firmly as if they had been rooted there for the season ; if a hedge, a sapling is cut out of it and used in afflicting that part of their bodies upon which they rest in the posture between standing and lying; if a wall, they are to have a race on the top of it, when, in trying to pass each other, they fall over on each side, some descending, perhaps, into the still stygian waters of a ditch, and others thrusting the 'human face divine ' into a bed of nettles ; if the boundary be a sunny bank, they sit down upon it and get a treat of beer and bread and cheese, and, perhaps, a glass of spirits. When these boys grow up to be men, if it happens that one of them should be asked if a particular stream were the boundary of the manor he had perambulated, he would be sure to say, in the manner of Sancho Panza ' Ees, that 'tis, I'm sure o't, by the same token that I were tossed into't, and paddled about there lik' a water-rot till I wor hafe dead.' If he should be asked whether the aforesaid pleasant bank were ,a boundary : ' O, ees it be, ' he would say, 'that's where we squat down and tucked in a skinvull of vittles and drink." With regard to any boundary perambulation after that he would most likely declare, ' I won't be sartin; I got zo muddled up top o' the banks, that don' know where we ambulated arter that.'" Melcombe Regis.—The late Mr. H. J. Moule, sometime curator of the Dorset County Museum at Dorchester, and a learned writer upon the county's antiquities, in his account of the " Weymouth and Melcombe Regis Borough Records ", which he edited in 1883, gives (p. 9) several extracts from a small folio volume, chiefly of law minutes, comprising depositions taken about the middle of the seventeenth century, recording a " perambulation " of the parish of Melcombe Regis about that time, in which one of the deponents, an old woman of 82 years of age, speaks of having joined in a " Procession" round the bounds of Melcombe Regis nearly three-quarters of a century previously, and deposes to an " old elderne stubb " (stump) at Washford as having been one of the boundaries. Radipole.—The same deponent also testified that the minister of the adjoining parish of Radipole, with his parishioners, used to go round their bounds on the same day; and at a pound on the bounds ("in the place of which pound a dairy house was sithence builded ") he read a chapter and " alsoe a psalm there to be sung ". After this the perambulation was continued, the villagers on the west side of some rails then standing and the townsmen on the east side. 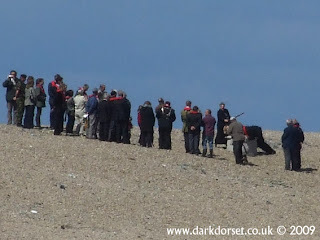 West Lulworth.—There is also in the same volume (C. p. 232) a reference to still earlier depositions (Elizabethan), in which an old man gives evidence as to his having often " after he was of remembrance " gone on procession, as the custom then was, with the minister and parishioners to take " view" of the boundaries of the parish of West Lulworth. The witness describes the route, ending at Furzeymill Pitt, " where they had usuall Beere and Cake-bread." Chideock.—A very complete account of the " perambulation " of the bounds of a parish and manor as entered in old records is that of Chideock, in West Dorset, which took place before the steward of the manor and many inhabitants of the parish. It is given by the Rev. T. Worthington in his History of Chideock, and copied by the late H. N. Cox in his account of that parish, contributed in a series of papers to the Southern Times in 1886. Mr. Cox also, like Mr. Barnes, alludes to the various steps that were sometimes taken to impress upon the memory of the boys who accompanied the perambulation the exact situation of the boundaries. "The historic function of walking the boundaries of the Borough of Bridport by the Mayor and Corporation and the principal inhabitants was the occasion of an amusing contretemps. In the course of the perambulation the city fathers came to a large millpond, which marked the boundary of the town. It was necessary to the performance of the ceremony that the pond should be crossed, and the Mayor, the Borough Surveyor, and another embarked on a large raft, on which they were to be towed across. They had not been long afloat when the raft was submerged by their weight, and the trio were standing up to their knees in water. When half-way over, to make matters worse, the rope became entangled, and, amid the laughter of the townspeople, the Mayor toppled over into the pond, and his two fellow-citizens were also precipitated into the water. They quickly regained the raft, but were as quickly thrown again into the muddy pool. The Mayor promptly described the boundary by swimming ashore, and his example was followed by one of his companions, but the Borough Surveyor remained alone on the raft, and was eventually towed to land completely drenched." Marnhull.—The Rev. Canon Mayo publishes in the Somerset and Dorset Notes and Queries (vol. xv, pp. 19-21 and 29-31), 1917, a long account of a perambulation held for the Manor of Marnhull on 7th and 8th June, 1808, and made by the then Lord of the Manor, John Hussey, Esq., his steward, and the principal inhabitants of the parish. A copy had been furnished to the Dorset editor of that periodical of the perambulation contained in a MS. book of Rentals and Quit Rents relating to the Manor. As Canon Mayo says : "It has a value as being a record of local boundaries, and illustrates a custom which at one time was universal in our county." 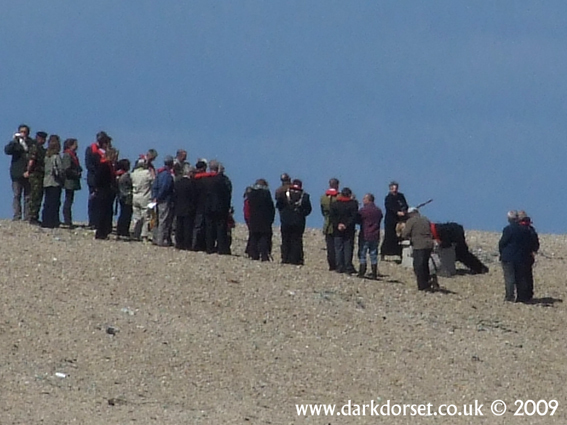 "The Portlanders seem determined to keep up their rights, which they annually maintain by an official visit to the well-known ' bound stone ' on the Chesil Beach. Holy Thursday, or Ascension Day, is, as by custom, the day on which the ceremony takes place. This year the number attending seems to have been augmented for some reason or other ; perhaps the fact of a new stone being used added importance to the affair. Be that as it may, there were many visitors, both by sea and land. "It is said the rights of the Portlanders extend to the new bound stone opposite Fleet, but the public would like to be enlightened as to the nature of those rights. There is one right at all events which does not extend beyond the Portland side of the stone, that is, we are informed that the lord of the manor of Abbotsbury, or rather the Earl of Ilchester, does not interfere with or claim the foreshore. Not that such a right would be of any use whatever, seeing the difficulty of telling where it is. The shingle shifts with the weather, and with it the foreshore, if ever such existed except in fertile imagination." which this ceremony was Ascension Day May 21st 2009. Below: 1965, Crowds gather in front of the Poole Custom House to 'beat the bounds'. To see more footage and old clips of the tradition of 'Beating The Bounds'.